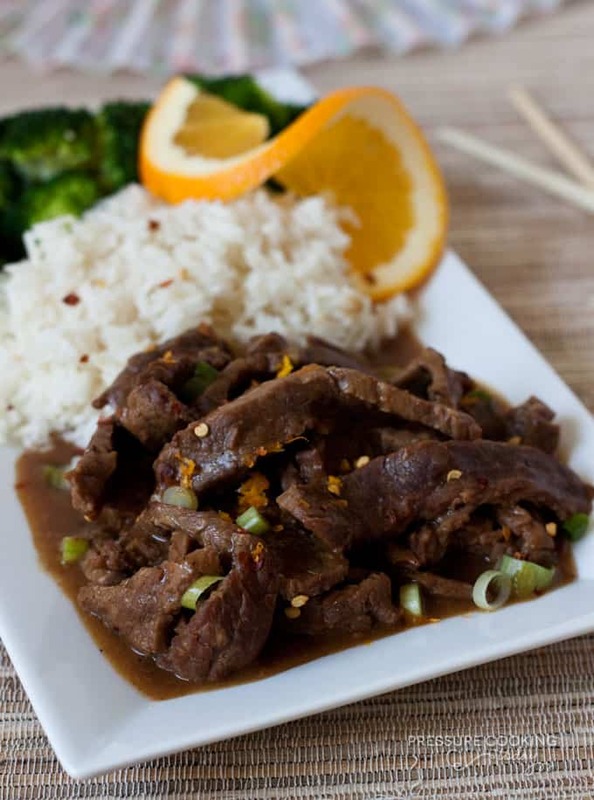 Strips of fork-tender flank steak in a spicy orange sauce. No need to buy Chinese take out when it’s so quick and easy to make at home. This recipe is adapted from a slow cooker recipe I found on Melanie Makes. I knew when I saw it, it would make a fantastic pressure cooker recipe as well. I’ve talked before about how slow cooker recipes are easy to adapt to the pressure cooker. If you have a favorite slow cooker recipe, try converting it to a pressure cooker recipe. You may like it even better. An Instant Pot is one of the most popular brands of electric pressure cookers. 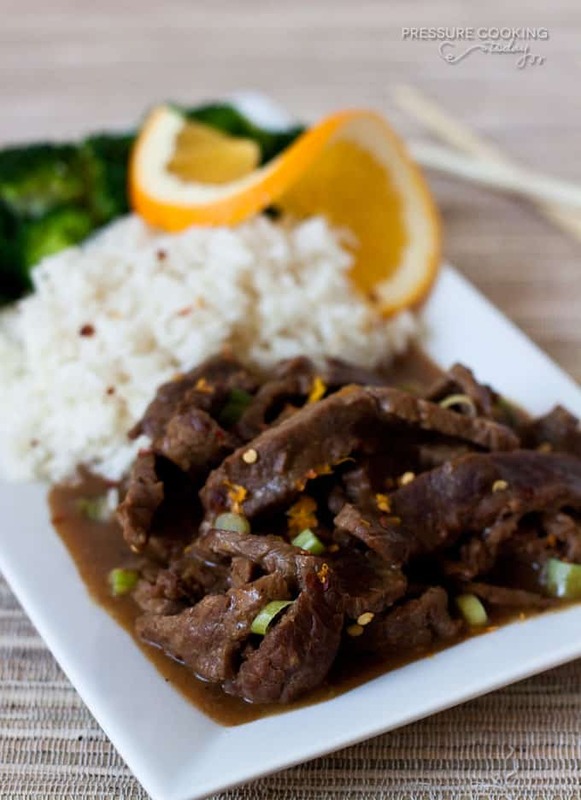 They are easy to use and your Instant Pot can help you create this delicious Spicy Orange Beef! My family enjoyed this recipe The sauce gets a rich flavor from the browned beef, and the fresh orange juice really brightens the sauce. I reduced the red pepper flakes in the recipe below because it was too spicy for my family, and we like things spicy. If your family doesn’t like it very spicy, I would reduce it to 1/4 teaspoon red pepper flakes. I based the cook time for this recipe on my Beef and Broccoli pressure cooker recipe, which is another quick and easy meal that you should try if you haven’t. Season beef with salt and pepper. Put oil in the cooking pot and select browning. When oil begins to sizzle, brown meat in batches until all meat is browned - do not crowd. Transfer meat to a plate when browned. When all meat is browned select Sauté and add garlic to the pot. Sauté for 1 minute. Add orange juice, soy sauce, sesame oil, red pepper flakes, and orange zest to the pot. Add browned beef and any accumulated juices. Select High Pressure. Set timer for 12 minutes. When beep sounds turn pressure cooker off and use a quick pressure release. When valve drops carefully remove the lid. Combine the cornstarch and water, whisking until smooth. Add cornstarch mixture to the sauce in the pot stirring constantly. Select Simmer and bring to a boil, stirring constantly until sauce thickens. Stir in green onions. Serve over rice; garnish with additional orange zest, green onion and red pepper flakes if desired. just found your webpage. tell me all you know about using instant pot to pressure cook. but first tell me why your instant pot has a browning button and mine does not? Hi Dana – glad you found me. The browning function on the Instant Pot is saute adjusted to more. Here’s a great post with tons of information https://www.pressurecookingtoday.com/instant-pot-duo-and-smartcooker/ Have fun! How does this work if you combine ingredients and freeze? If I put in the instant pot frozen what is the length of time needed to cook plus pressure release time? Can I use a crock pot instead of a pressure cooker? Hi Renee – I haven’t tried it, but other similar recipes cook it on low for 7 – 8 hours. This was my first recipe I used in my new pressure cooker. Turned out very good. I only had 1lb of fajita steak meat. Next time I will slice the meat up more. Meat was very tender and delicious. Thanks Bernadette! A great pick for a first recipe. Have fun with your new pressure cooker! Just a comment, I have found that if I want to slice my beef into thin strips it is much easier to partially freeze the meat. This makes slicing so much easier and accurate. Thanks Phillip – great tip. was on sale, so I used that. It was delicious. This will be a regular! Thanks Lavinia! So nice to hear. Glad to know it works well with sirloin. Looks great! How do the cooking times change if I use chicken instead? Just a 3 minute cook time with bite size pieces of chicken. Thanks Cynthia – I’ll have to try it with chicken. I have a chuck round roast. Do you think I can substitute it in this? If so, would you suggest doing it whole, slicing like the flank stake, or cutting into larger chunks for shredding? Thanks for sharing your additions. Glad you enjoyed it and made it your own. Delicious! So tender and flavorful! I would add to Marci’s question that the meat will cook longer if it’s cold because it will take a bit longer for the pressure cooker to come to pressure so in essence the cooking time is somewhat longer but the cook doesn’t need to add any cooking time. And while we’re talking about meat, if you put the unfrozen meat in the freezer for 20 to 30 minutes before slicing it, it will be much easier to slice into those nice 1/4″ strips. While I love flank steak it can be pricey. Flat iron steak will work just as well and at my supermarket yesterday was a fraction of the price. $6.99 vs. $12.99 per pound. Cut the flat iron steak in half longways and then each half against the grain into 1/4″ strips. I browned the meat, sauted the garlic and then put the sauce ingredients in the pressure cooker with the meat and then placed it in the fridge to cook for dinner tomorrow night. If the meats cold, is that going to change the cooking time? Hi Marci – love the idea of making it ahead. No, I don’t think you’ll need to change the cooking time in the recipe because the meat is cold. If it were a big roast you might, but with the small pieces it shouldn’t be a problem. This sounds so yummy! I will try it over the weekend. I have to eat more protein I am told, so this looks perfect for me. I love that I know what is in this and not like some restaurants where they add a lot of stuff. Thanks!! Thanks Winnie – it is great to be able to control what’s in your food. Hope you enjoy it! I would like to try this recipe but I have a stove top pressure cooker, not an electric one. How long should I cook it at high pressure? Hi Michele – the cook time for a stove top pressure cooker should be the same as the electric pressure cooker. Time doesn’t start counting down until the electric pressure cooker reaches high pressure. That looks delicious Barbara. I love making Chinese take-out at home. This looks like a dish both Bob and I will love. Thanks Carol! Let me know what you think if you give it a try.